The proximity to Lake Siljan is a blessing in itself. For active guests, the waters of the lake provide a wealth of opportunities in the summer months. In winter, the ice and the wide open spaces are the perfect setting for all kinds of fun and games. If you would like to explore the region and take part in activities, you will find everything you need right nearby. You need only travel a few kilometres – no more than 50 minutes – to reach a wide range of sights, attractions and activities for all the family. This page presents a selection of the things that you can see and do in the Siljan area. Stiftsgården also has plenty to offer if you prefer a peaceful, relaxing break. Rättvik is only a ten-minute walk away, and the town has excellent shops and all kinds of activities to choose between. 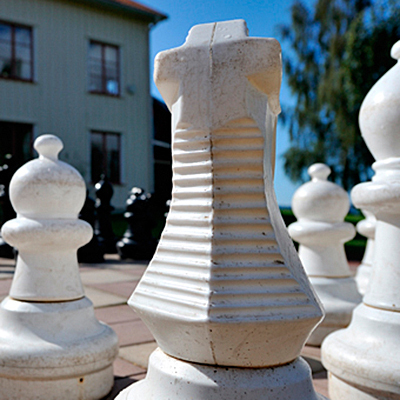 Stiftsgården provides a wealth of entertaining conference and leisure activities all year round. As Stiftsgården is located on the shores of Lake Siljan, we have our own bathing area with a jetty and a sauna section. We also have around 20 canoes that our guests can borrow free of charge. Other facilities on site include a football pitch, beach volleyball court and boules area, as well as promenades and rambling trails along the shores of Lake Siljan. Guests who visit us in winter and enjoy all kinds of skiing will find both slalom slopes and prepared cross-country routes close to Stiftsgården. Simply the best leisure pool complex. A wide range of activities in a compact area. Full speed ahead for all the family. Top-class children’s lagoon. You are sure to have a wonderful time at our magnificent Aqua Nova leisure pool complex. Take a swim in the swimming hall, have a work out in our weight-training room and Nautilus Gym, or join one of our keep fit classes: Water aerobics, Power and Spinning. We also have Swimming schools, Crawl and swimming courses for adults, massage facilities, solariums and bowling lanes, and we organise all kinds of events. Water slides – 3G, Black Hole and Magic Eye. Carl Larsson is best known to most people for his watercolours and his paintings of his family at Sundborn, an idyllic little town set in beautiful surroundings that showcases the happy family life that his paintings depict. Together with Karin, his extremely artistic wife, Carl Larsson made his home in Sundborn a very special place. So special, in fact, that tourists came to Sundborn to visit his and Karin’s home while the family was still living there! Today, around 50,000 people a year visit Carl Larsson’s home to admire the unique interior design style. Grannas A Olsson & Nils Olsson make Dala Horses in Nusnäs. Visit their shops and see how Dala Horses are made. DalaTravet Rättvik (Dala Trotting Rättvik) is operated by the Siljan Trotting Company, a non-profit association. The association has 70 members and the board consists of 7 people. The trotting track is in Hedslund, 1 km north of Rättvik. The trotting company was founded in 1919 and the track was officially opened in 1955. DalaTravet Rättvik organises trotting competitions 20 times a year, as well as four lunchtime trotting events. Dalhalla is an outdoor arena of international calibre, fully comparable with the very finest installations in Europe. Dalhalla now has 4,000 seats. Through Dalhalla, Rättvik has made its mark on the international music map. Folkmusikens Hus is the folk music centre in the Dalarna region, firmly established and with a broad, outgoing agenda. The intention is to spread familiarity with – and interest in – folk music and dancing, both as fascinating history and as a creative part of the contemporary music scene. Activities include exhibitions, concerts and dances, education courses, archive service an IT development. The shop is stocked with a wide range of CDs, sheet music and literature and acts as an information hub for folk music and dancing. Framtidsmuseet (The Future Museum) nurtures the joy of discovery! The museum gives you the chance to experiment and explore with all your senses. See, hear, do and be amazed! Ask questions and find answers in an entertaining and stimulating environment. The Future Museum is home to all kinds of interactive natural science experiments, a planetarium, exhibitions, pedagogical workshops and a museum section. So much to see and do for inquisitive visitors of all ages! Just when you think you have reached the end of the road, the landscape suddenly opens out and Furudals Bruk comes into view – a factory town dating back to the eighteenth century. Here you will find the Furudals Bruk Golf Club. The course is set in a traditional landscape of woods, hills, lakes and watercourses – close to nature and absolutely delightful! The proximity to Finnmark, with its deep forests populated by bears, moose, lynxes and wolves only heightens the experience … “Wild, wonderful & well-preserved”. Leksand Sommarland is an amusement park for all the family and is constantly developing. It currently comprises a WaterLand, MotorLand and SummerLand. In all, there are more than 80 different activities – but just one admission fee. This is the perfect place to spend a day packed with amusements for all ages and interests. Welcome to a wonderful day of entertaining experiences. M/S Gustav Wasa was built in 1876 and still sails the beautiful waters of the Lake Siljan in the Dalarna region. Board the vessel to make the crossing from Rättvik to Leksand or Mora. Enjoy a delicious meal and view the Dalarna region from the water. Located in Grönklitt, Orsa Björnpark is the largest bear park in Northern Europe. It is not an ordinary zoo, but a park that presents a unique opportunity to observe the animals in their natural environment. The park is home to bears, wolves, lynxes, red and mountain foxes, eagle owls and wolverines. It also organises a variety of exhibitions, lectures and “bear excursions”. The new attraction this year is the Children’s Predator School. Experience a genuine racing rush along our 1,240-metre track. Climb into a go-kart with a top speed of 70–80 km/h, race along just a few centimetres above the asphalt and tackle the hairpin bends, up and downhill stretches and the long straight sections. The age limits are from age 7 in the small karts and from age 13 in the bigger carts. Minimum height: 145 cm. The newest addition to the range of activity centres in Rättvik is the bowling hall, which has eight lanes of international standard, as well as pool tables and dart boards. After your game, relax and enjoy a delicious meal in the restaurant. Rättvik Golf Course is located approx. 2 km from the centre of town. It is an 18-hole park course with a comprehensive irrigation system. Our green keepers work hard to care for and improve the course – and they have been very successful! The course naturally also has a driving range, practice green and approach area, etc. Golf buggies for hire, as well as trolleys that players can borrow free of charge. Siljan Turism is a company owned jointly by 630 companies, organisations and associations, as well as the Municipalities of Leksand, Rättvik, Mora and Orsa. Its purpose is to take professional responsibility for the marketing of Siljan’s main profile, subsidiary profile, products and services, with a view to highlighting the town of Siljan as one of the most interesting destinations in Sweden for visitors looking for top-quality experiences. Scandinavia’s first parallel summer luge run on a slalom hill. A 725-metre high-paced adventure for all the family. Children under the age of 7 must be accompanied by an adult. The Rättvik hill is famous for being an excellent place to learn snowboarding – perhaps the very best in the entire Dalarna region! Join Santa Claus and the elves in their larks and japes, and see what tricks the trolls are up to. Go to Troll School and learn the trolls’ own language. Visit the wonderful witch’s school – only for kids! In addition to all the activities, you can stroll around the area and admire the beautiful log cabins in the 11-hectare Fairytale Land. See Santa’s workshop – one of the largest log buildings in Europe. Inside, you will find the shop, which is full of craft items, toys, Christmas gifts and souvenirs. Santa’s Workshop also houses the Café, where you can enjoy delicious sandwiches, wonderful pies, pan pizza and freshly baked rolls and hot chocolate. Anders Zorn is one of Sweden’s most famous artists. His international reputation is primarily based on his portrait art, which displays his remarkable skill in representing the character and personality of his models. Anders Zorn is also rightly famous for his etchings, and was considered one of the finest exponents in the world of this art form. In Sweden, Anders Zorn is best known for his nudes and for his pictures of everyday situations, which present ordinary people at work and at leisure.